Jean-Charles Boisset designed this Healdsburg tasting room with an eye to the French bistro experience. The peacock has landed in Healdsburg, n’est-ce pas? The newest JCB Tasting Salon has opened on the Plaza in downtown Healdsburg, the latest outpost of wine-soaked ultra-lounges designed by French wine impresario Jean-Charles Boisset, and the only such of his salons in Sonoma County that’s not secreted away in a wine cellar. 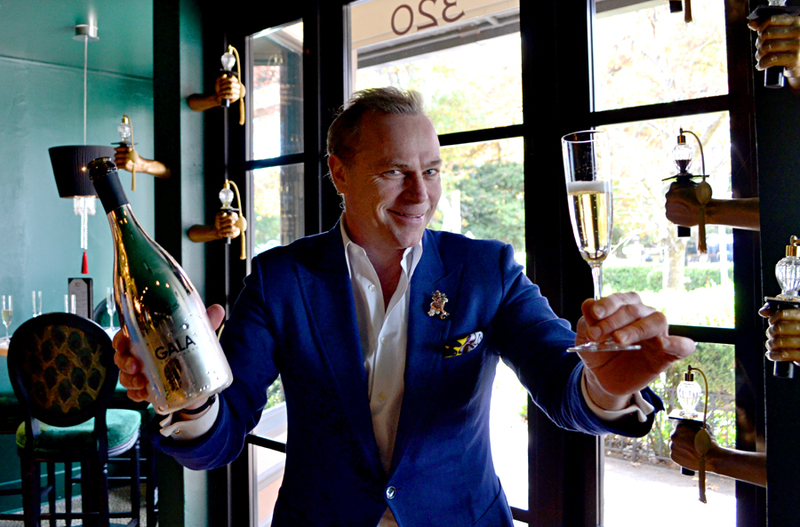 After a soft opening of several months, the JCB Tasting Salon hosted a grand opening on October 29, 2018, including media tastings with founder Jean-Charles Boisset—who was on his way to even more engagements in Japan. If you haven’t been to a Boisset property—well, honestly, maybe more so if you have—it can be difficult to describe. Is it all about high style, or is it more about the earth, and the simple pleasures of rustic Burgundy: bread, cheese and wine? 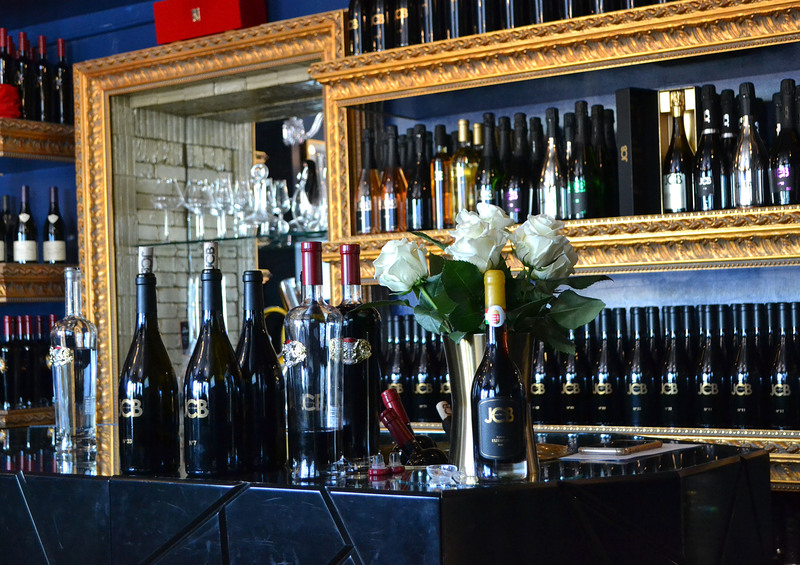 Sitting down for a chat with Boisset helps to put this flashy new tasting room into a down to earth perspective. 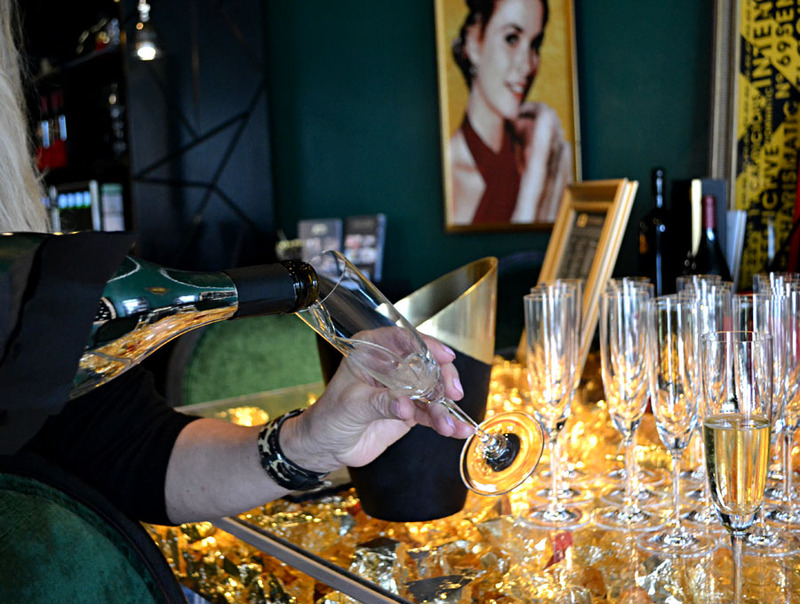 Boisset is partial to custom-designed jewelry, fine crystal and shiny gold bottles, that’s clear—and the aforementioned peacocks are real, too, on view at Boisset’s Buena Vista Winery as well as this tasting room. And the curious skull theme lives on in an umbrella handle, also for sale in the tasting room. He’s a tireless product developer, sourcing Champagne from, well, the source, a family-run grower operation in Champagne, France, for his Gala gold edition bottles; and for the fine coffee for beans, also for sale at the tasting room. But he’s designed this Healdsburg tasting room, which housed an earlier iteration of the JCB experience until five years ago, with an eye to the French bistro experience: up front, visitors may sit at small tables and people-watch on the square. Beyond a golden sculptural tree, a table hosts larger groups, while the back room, darker even now without the darkening curtains that are still on order from France, invites longer lingering for canoodling couples, jovial groups, friends and family. The lounge in back, by the way, is the first time that a JCB lounge has traded colors like gold and crimson for green and blue, the colors of the peacock, yes, but also of the earth moving toward the sky, says Boisset. 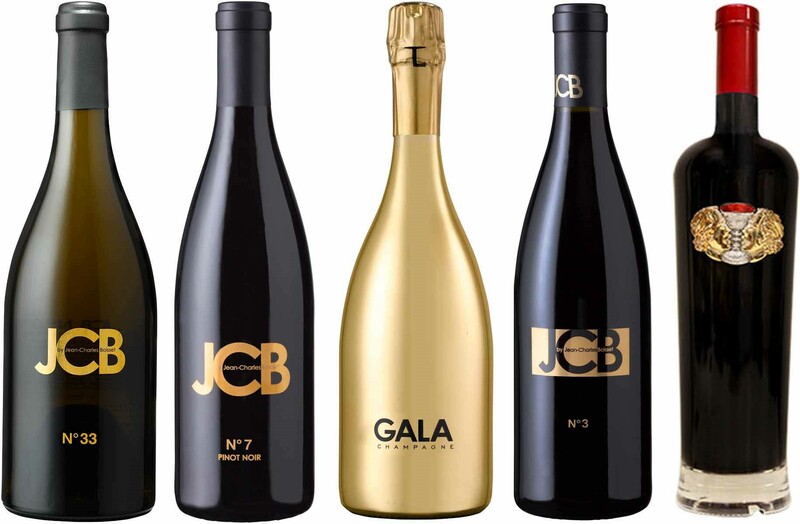 Boisset says that a wine writer first encouraged him to put his own name, or initials, on his line of wines now called “JCB.” In Sonoma County, Boisset also owns DeLoach Vineyards and Buena Vista Winery. 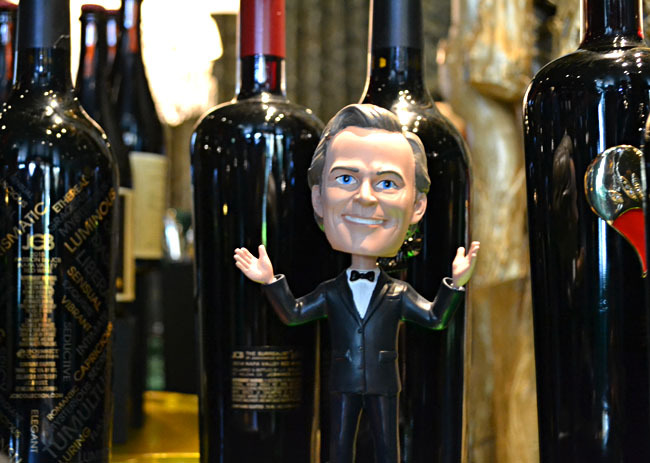 But the enigmatic numbers on each wine refer to a point in Boisset’s life that connects him to the life in wine. The JCB No. 7 ($60) was inspired by his first positive experience with red Burgundy wine, Boisset relates, when he was playing sommelier at age seven, at what he says was a humble residence above the family wine cellar in Burgundy. The story goes like this: he drank the rest of the guests’ wine, but his mother relaxed the punishment because he clearly enjoyed it. And just how French is that? Winemaker Brian Maloney is tasked with re-creating, then, the sensation of enjoyment of that first red Burgundy wine, with a finely tuned blend of Green Valley of Russian River Valley Pinot Noir. The end result for JCB wines is a profile that evokes such a memory, or mood, according to Maloney and Boisset, more than a particular vineyard or vintage. 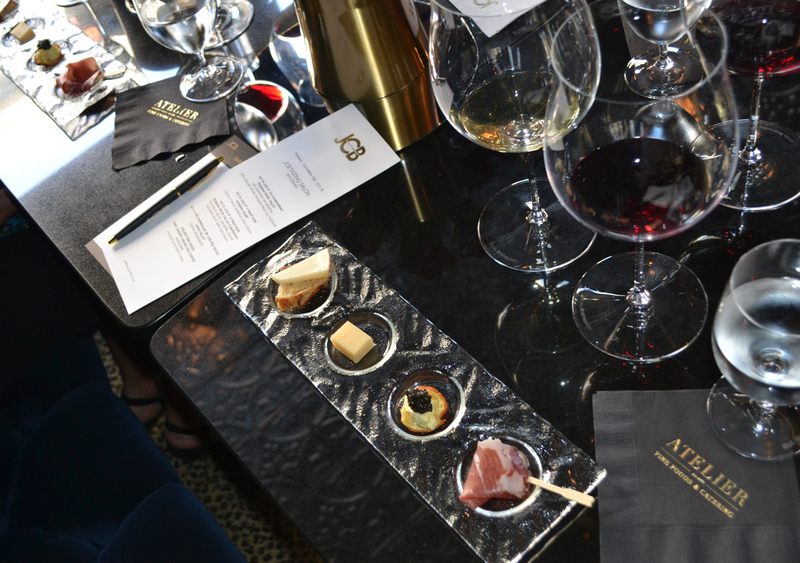 Also available at the tasting room by appointment: small food pairings provided by Boisset’s Atelier catering and fine food company. 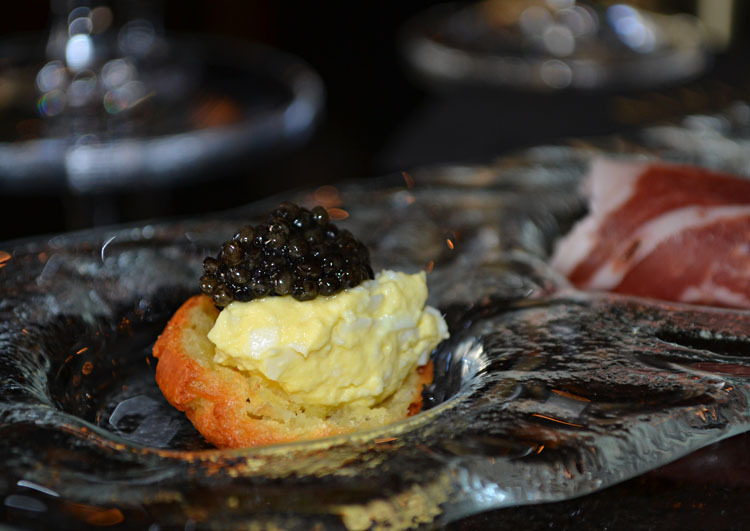 Caviar egg salad on a tiny puff pastry? Yes. Any visit with Jean-Charles Boisset is too brief, as while the prolific vintner describes his winemaking philosophy in grand gestures—also more slowly, in personal histories, and humble narratives, he entreats us to enjoy life to the fullest by indulging in such French staples as bread and cheese, and other delightfully harmonious or incongruous paths toward the enjoyment of wine and life. Indeed, my main recommendation to visitors is to not write off, nor be overly swooned by the more gilted, flashy aspects of the JCB salon, but to experience these wines, Sonoma County and trans-Atlantic alike, with a thought in the back of your mind that there’s a high-flying Frenchman out there that would be really happy to talk to you about how you experience these wines. 320 Center Street, Healdsburg, CA 95448. Open daily, 11am–7pm. Wine flights, $30–$50. Bottle service available. 707.934.8237.